We are keeping it busy here at Bulgarian JUG with even more workshops! 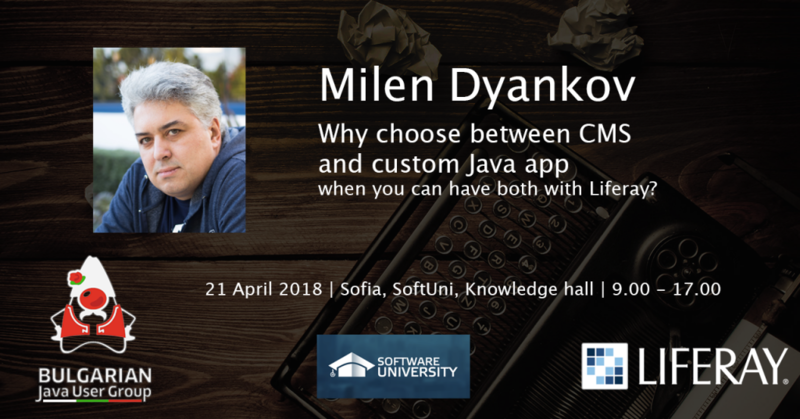 This April 21st one of the most beloved speakers of jPrime Milen Dyankov will give a full day Liferay workshop here in Sofia! “Let’s just install (some famous CMS here) and throw our precious content there. But that’s nightmare to customize and extend, let’s build it all from scratch and follow the most recent software trends. Forget about trends, I want this in production now …” Have you been there? Did you feel like there is no middle ground? Well there is, and this workshop will prove it to you. With that skill set and the powerful open source platform at hand we’ll create a complete interactive solution in just one day! So.. April 21st at SoftUni, Knowledge hall!